Hurrying down Boulder Canyon early one sullen spring morning, just rounding a bend, I saw him, down in the creek, a fisherman working his flies in silhouette over the silvered water. I saw him only for an instant, a spectral image in black, cut into the creek beyond him. He looked out of another time and place, but I knew him, remembered him. I wanted to give him a Boulder name, that of some old habitué of Boulder Creek. He might have been E.B. Edwards, Charlie Sundquist, or Nick Schons. Maybe he was One-Armed Billie Marquette, Bill Smith, Al Olson, or Lasses Ralston. In any case, this was the original, the model, the archetype that can flash on consciousness and remind us of sources, beginnings, and raise floods of sensation and memory. By naming him, I thought I might perhaps anchor myself more securely into the legend of this landscape, my native watershed, the water out of which my mother made me. Forms and images like this, I know, are as old as time and have this powerful way of taking on a local habitation and a name. But, at this instant, no single name seemed right. The image remained, simply, The Fisherman. That instant of vision on the creek, sent shivers through me that were slow to subside. Seeing a ghost, I thought, must be like this. The Irish poet W. B. Yeats saw him, too, in the mountains of Connemara. His “presence” invaded Yeats’s imagination and poems, there to become a dominant symbol of rigor, integrity, passion, and sturdy manhood. A symbol of what might be, amid all the spiritual squalor, intellectual sloth, hate, and ugliness that the poet found in the Irish life of his time. This solitary angler became the symbol of what was, perhaps, Yeats’s best hope for his native land. And passionate as the dawn. 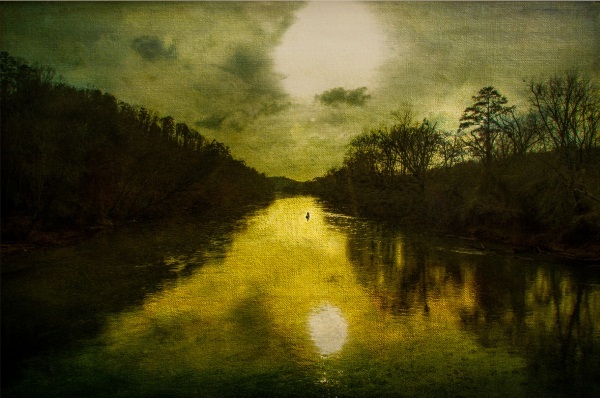 “The Fisherman”, a dark and melancholy silhouette, whether on a Connemara mountainside or in Boulder Canyon, now bursting into life like the dawn…. As I write these words, the very wonder of words themselves, of language, of the propensity and need for words to make the poem, floods over me. It is a gift to my understanding that fishing and language are somehow inextricably bonded, that the act of fishing is fulfilled, perhaps even begun, in the act of language! Yes, that’s it! The essential Fish, this Fish that every fish expresses, is drawn up first in a net of words: into The Poem. Regardless of how devastating the confused events of our lives become, whether in Connemara or Colorado, there’s promise of another way: that ancient, ever-youthful, angler stands there still in the cold grey dawn, casting his flies from the past into the future to a prey that is not a prey at all, but the end of a quest for a renewed life of the spirit. Editor’s note: This post originally appeared in the Bouldercreek Angler on September 5. Gordon Wickstrom passed away on September 18th. Our hearts go out to his family. We at the Blue Line will miss him very much. His contributions to our community blog have been like no other, shifting our focus from density debates and development schemes to a world in which Boulder boys set off to fish the creek, discover girls, and thrill at Blackstone the Magician. Our correspondence with him has been brief but delightful; we are grateful. Thank you Gordon. You can listen to Gordon read a portion of this essay in a 2008 recording made through the Maria Rogers Oral History Program at the Boulder Public Library. Previous Topic: EVs to the Rescue?